One thing I miss in many modern comics that the classic comics always provided was a recap page. Say what you will about Stan Lee's weaknesses as a writer but The Man was onto something when he said that a writer should treat every story they wrote as if it was going to be the first story somebody was ever going to read. Even in these days when reprint editions, trade-paperbacks, Internet shopping and on-line archives have made it fairly simple for a fan to read the previous issues of a series, the idea of making every single issue of a comic accessible to new readers is a novelty in these days of "writing for The Trade". Thankfully, the recap page is alive and well in Eric Trautmann's Red Sonja. 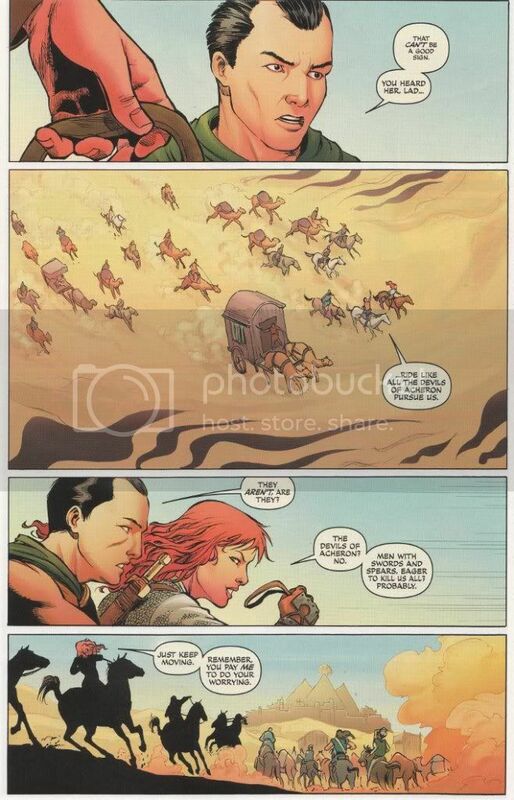 The above page neatly summarizes the last 10 months worth of issues and how Sonja wound up in her current position as a guard on a caravan bound for Stygia - a nation that long-time Conan fans know is not hospitable to outsiders under good circumstances but does have the advantage of being a good place to hide. Why? Because nobody would ever expect a non-Stygian to willingly flee toward Stygia. This issue is mostly one extended action scene, as Sonja rides forth to delay a rival merchant who has hindered her current employer in the past. Despite the heavy focus on swordplay, riding and high adventure, Trautmann does a wonderful job of establishing Sonja's personality for new readers. Sonja is bold, a born leader and has a wicked sense of humor that comes to the surface when her life is in danger. The artwork by Walter Geovani is perfectly suited towards this kind of book. He is a wonderful visual storyteller, who knows how to properly draw an action sequence where several things are happening all at once. Geovani also draws Sonja as a woman who is attractive yet athletic - a task that surprisingly few Red Sonja artists have proven capable of in the past! Too often artists either depict Sonja as a waif who shouldn't be able to lift a sword much less swing it or make her grotesquely muscular. It helps that Geovani has abandoned Sonja's infamous scale-mail bikini costume in favor of a chain-shirt and leather banded-skirt combo that more closely resembles the original character design from the days of Roy Thomas' Conan The Barbarian. If you're a fantasy fan who has resisted the She-Devil With A Sword in the past because of the cheesecake heavy covers this series in infamous for or if you're someone who enjoys books centering upon strong heroines, I recommend this book highly. This issue is a perfect jumping on-point for new readers and a textbook example of not just how to make a good fantasy comic but how to create a good, accessible comic of any genre.